I’ve finished another book and I ended up in the world of medicine this time. Let me just say, there have been some weird ideas going around within this discipline over the last 100 years…. Leprosy is one of the oldest and worst illnesses known in our history. Early in the 1800’s, it plagued Norway worse than ever before. The illness terrorised the areas of Western Norway the worst. Between Stavanger in the south and Tromsø in the north people lived in fear for this horrible disease. People who suffered from it became unrecognizable and looked like something from your worst nightmare. Between 1830 and 1870 this was the illness that caused the Norweigan public most fear. The government wanted to modernize the country and keep up with the progress in Europe, but Leprosy kept Norway in a prehistoric and primitive state. This is a chronological written book. I don’t quite know what I expected from it, but I got a lot more medicine that I thought I bargained for. 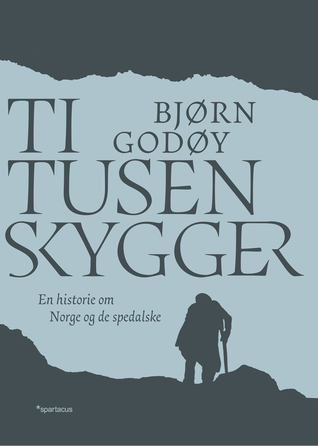 The way Godøy has written it is very informative, and you don’t need a medical background to understand it, but it helps for sure. I had to Google a few words every now and then, and Google hadn’t heard about all of them. I ended up asking a friend of mine who studies medicine about one of them and first then did I get a reply. The reason for this might be that the language used in Norway back in the 1800s were strongly influenced by Danish since we were in a union with them for 400 years. The research Godøy has used is old and thus heavily influenced by the period it was written in. I found it amusing to read this old Norwegian-Danish from time to time. Some of the words were incredibly funny, and they used soooo many words to say a short sentence! I’m glad we’re not doing that any more. I’ve always had the impression that the public shunned people who suffered from Leprosy. This is what I’ve always been told. This book proved my beliefs wrong. Apparently, people weren’t that careful around people suffering from the disease, and this was one of the reasons that so many doctors for a long time believed that the illness was passed down in families. Many seemed to struggle with separating from the sick, which is understandable since it was people from all classes and all ages. Others were more inclined to send their sick away. How this was done and what solutions the government provided is well described in this book. The book mainly studies the research of C. W. Boeck, Thorvald Buchholz, D. C. Danielssen, Gerhard Armauer Hansen, Jens Johan Hjort, and O. G. Høegh. They all presented different possibilities about leprosy and its regime over Western Norway. Some of the ideas seem possible, while others seem absolutely dumbfound. Of course, it is easy to say this today with all our modern technology and knowledge about medicine. Back then it took a lot more time to do research and collect data, people also seemed to be more unfriendly towards doctors and the like back in the days. I suppose this had to do partly with the fact that people living outside the main cities weren’t as educated as their urban neighbours, and also that the government tended to look down on farmers and uneducated people from the countryside. This tendency to look down on uneducated people is strongly portrayed in the book. The way Godøy has described the people living in Western Norway, through the sources he has used, is just beyond imagination for me. I can understand that people outside the cities weren’t as caught up to speed on things, but Godøy makes it sound like Western Norway were 1000 of years behind the rest of the country. I find that hard to believe, but I think that is me being coloured by my own time period. I will recommend this book to people who are interested in medicine and leprosy. It didn’t quite suit my taste in literature, but it was interesting to learn some new things about leprosy! The Black Death, when leprosy invaded Norway for the first time in 1349 (? ), has always interested me, and I think I hoped to learn more about that in this book. Instead, I got the more modern version which wasn’t a bad substitute. At times there are a little too much technicalities surrounding the medical and this makes the book a little heavy. Otherwise, it is well written and will most likely please an interested reader. This book has not been translated and does therefore only exist in Norwegian.